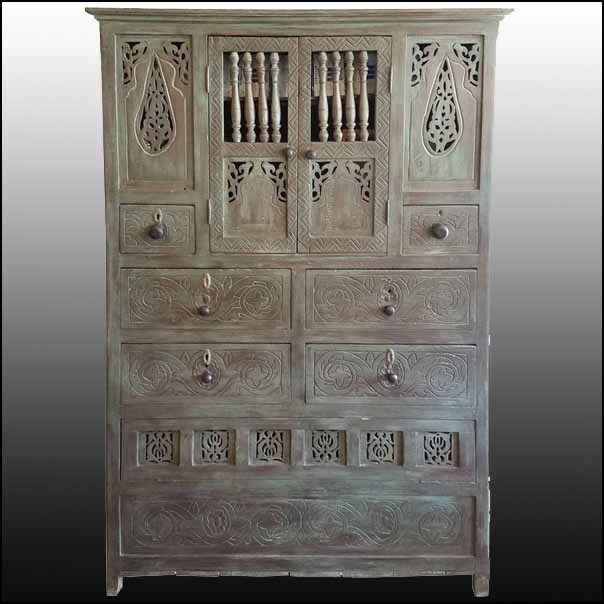 Aged green handmade Moroccan cedar wooden cabinet measuring 64” in height, 44” in width, and 15” in depth, and featuring four medium size drawers, two small drawers, a vertical double door, and a bottom flop door. Plenty of storage space as seen in pictures. Lots of carvings throughout. Can work as a book shelf or cloths cabinet, to name a few. Please contact us if you have any questions, or for a shipping quote. Thank you for shopping with us ! !